The Pile of Poo emoji (💩), also known simply as Poo on iOS devices, is an emoji resembling a coiled pile of feces, usually adorned with cartoon eyes and a large friendly smile. It can be used to convey disappointment, but it still holds its literal meaning. The emoji is in the Miscellaneous Symbols and Pictographs Unicode block: U+1F4A9  PILE OF POO (HTML &#128169;). A smiling and steaming pile of poo emoji first appeared in the set of 90 emoji for the J-Phone released in 1997. In 1998 or 1999, Japanese mobile operators NTT DoCoMo, au, and SoftBank Mobile each defined their own variants of emoji using proprietary specifications, the first of which was created by NTT DoCoMo employee Shigetaka Kurita. In 2007, Google, looking to expand its presence in Japan and Asia as a whole, partnered with au to develop emoji for Gmail, a project codenamed "Mojo". Gmail's design for the pile of poo emoji lacked a face and was circled above by animated flies. When deciding which emoji to include, Takeshi Kishimoto, Google's Japanese product manager, went directly to the manager of Gmail and convinced him that the pile of poo emoji was the "most useful" emoji. This was corroborated by a statistical analysis undertaken by Google to determine which emoji were the most popular among Japanese users. According to Google software engineer Darick Tong the pile of poo emoji was "way up there" in terms of popularity. Design for the emoji was left to Google Doodle artists Ryan Germick and Susie Sahim, who sought to put a "Google spin" on the existing emojis. They drew inspiration from the existing emoji designs as well as the character Poop-Boy from the Dr. Slump manga by Akira Toriyama. They limited themselves to a size of 15×15 pixels and colors used only in Google's logo. Google first supported emoji in Gmail in October 2008, and Apple added Pile of Poo to iPhone OS within the first emoji release of Apple Color Emoji on November 21, 2008. 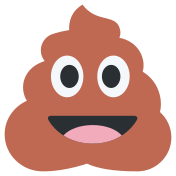 Pile of Poo was added to Unicode in Unicode 6.0 in 2010, and to Unicode's official emoji documentation in 2015. In 2017, a "frowning pile of poo" emoji was shortlisted for inclusion in a future Unicode release. After negative feedback on this character from WG2 experts including Michael Everson and Andrew West, the frowning pile of poo emoji was removed from the list of emoji candidates. ABC News' Samantha Selinger-Morris states in her 2016 article that the smiling poop emoji is "one of the most popular emojis in existence" due to its "ineffable charm" and "ability to transcend language barriers and political differences." As such, it has been featured on Mylar birthday balloons and cupcakes. In 2016, a termite mound in Western Australia was transformed into a smiling poop emoji by a couple with supplies from Kmart. The icon is a character in 2017's The Emoji Movie, voiced by Patrick Stewart. ^ "💩 Pile of Poo Emoji". Retrieved 29 March 2017. ^ McDermott, Kirstie (8 March 2015). "8 Emojis You Might Not Know The Real Meaning Of | Stellar". Retrieved 29 March 2017. ^ "Unicode Character 'PILE OF POO' (U+1F4A9)". FileFormat.info. Retrieved March 29, 2017. ^ Sternbergh, Adam (16 November 2014). "Smile, You're Speaking Emoji". Retrieved 29 March 2017. ^ Schwartzberg, Lauren (18 November 2014). "The Oral History Of The Poop Emoji (Or, How Google Brought Poop To America) | Fast Company". Retrieved 29 March 2017. ^ Healy, Claire (12 May 2015). "What does the stinky poop emoji really mean? | Dazed". Retrieved 29 March 2017. ^ Schwartzberg, Lauren (2014-11-18). "The Oral History Of The Poop Emoji (Or, How Google Brought Poop To America)". Fast Company. Retrieved 2018-12-31. ^ Burge, Jeremy (2018-11-21). "Apple Emoji Turns 10". Emojipedia. Retrieved 2018-12-31. ^ "💩 Pile of Poo on Apple iPhone OS 2.2". emojipedia.org. Retrieved 2018-12-31. ^ "Unicode 6.0 Emoji List". emojipedia.org. Retrieved 2018-12-31. ^ "Emoji Data for UTR #51". Retrieved 26 March 2017. ^ "Kangaroo, Softball, Frowning Poo Emojis Possible For 2018". Emojipedia. 2017-08-03. Retrieved 2017-08-18. ^ Anderson, Debbie (22 October 2017). "Feedback from WG2 email discussion list on PDAM 2.2" (PDF). ^ Unicode Emoji Subcommittee (26 October 2017). "Ad hoc recommendations for Emoji 6.0" (PDF). ^ Selinger-Morris, Samantha (9 December 2016). "Why are we so passionate about the smiling poop emoji? - ABC News (Australian Broadcasting Corporation)". Retrieved 29 March 2017. ^ Lieu, Johnny (5 July 2016). "Poop emoji made from a termite mound is the roadside art we need". Retrieved 29 March 2017. ^ Amidi, Amid (October 10, 2016). "'Emojimovie: Express Yourself' Promises To Make You A Better Person". Cartoon Brew. Retrieved November 20, 2016. ^ Giardina, Carolyn (January 18, 2017). "Patrick Stewart to Voice Poop Emoji in 'Emoji Movie'". The Hollywood Reporter. Retrieved January 25, 2017. This page was last edited on 4 April 2019, at 19:02 (UTC).